For an introduction to an unknown city, you can’t beat the bus tour. Two of New York’s best hop-on, hop-off double-decker companies, City Sights N.Y and Gray Line had stops just outside our hotel in Times Square, with an army of zealous agents selling tickets on the pavement. We almost fell for Augustin’s fantastic Gray Line deal but, in the end, succumbed to Wade’s superior salesmanship and bought a City Sights NY 3 day package for $49, saving $137. Go figure! Off and on, over the next two days we surveyed New York from the top deck of our big blue City Sights bus. We discovered its districts – Theatre, Garment, Flower and Financial. We followed the rise of its buildings storey after storey into the clouds; the greats like the Empire State, the Rockefeller Centre, Woolworths and the Chrysler, as well as hundreds of unknown art deco gems. We rolled up the west side of Central Park and down the east. We spotted outcrops of schist, (the bedrock in which NY’s skyscrapers are anchored) between the trees on one side and peered into the houses of the super rich and celebrated on the other. We cruised past those legendary Avenues – Park, Lexington, Madison and Fifth and along its famous Streets from 42nd to Wall. We passed through Greenwich Village, Soho, Noho, Tribeca, China Town, Little Italy and Harlem. We saw those great landmarks, Carnegie Hall, Madison Square Gardens, the Lincoln Centre, Grand Central Station and the great galleries, the Met and the Guggenheim. We caught glimpses of ordinary life, old men sitting on the steps of Harlem brownstones, old ladies shuffling down to the corner store, little kids playing in parks, big kids hanging out on street corners. We skirted around its tragedies; the Twin Towers site, where jack hammers pounded behind a high board fence, the spot where John Lennon was shot and the YMCA where his assassin prepared for the kill. We saw a fence, hung with cards for the victims of 9/11 and a churchyard draped with yellow ribbons for the victims of the War in Iraq. We passed icons of TV and movie land, like the Seinfeld Soup Nazi’s kitchen and Tiffany’s. The City Sights N. Y. tour gives a great introduction to New York and a wonderful insight into the life and culture of this fascinating city. What takes it beyond a mere overview is the exceptional quality of the guides. There’s no crackling recorded commentary on the City Sights NY bus. Real, live, walking, talking people lead you through the tour. All extremely individual, they have their own particular takes on the place and their own particular specialty. One of our guides was an architecture aficionado. With him, no building, great or small and no unusual detail escaped our attention. Another was a political animal, with all the inside gen. on how the city runs and who runs it. Another was practical chap with useful information on living in New York; the cost of apartments, best delis and diners, worst departments stores and most accessible laundrettes. They were all compelling story-tellers who knew their city and wanted the punters to know it too. Thanks for an informative post. This city is next on my list and I love a good bus tour so I will make sure that the City Sights NYC bus tour is the one I choose. Great to hear from you, Vicky. 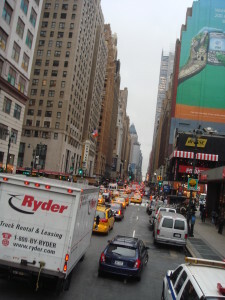 Truly, I found this bus tour amazing and as for NYC, well…just go there!